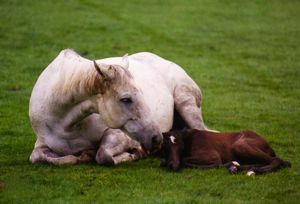 'Dummy foal' is one of the terms used to describe NMS, Neonatal Maladjustment Syndrome. Despite the apparent severity of the symptoms at birth, the long-term prognosis is said to be good for those foals who survive. 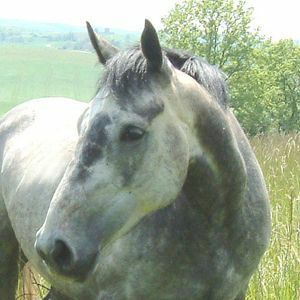 Xas was a survivor and her story tells how in fact the challenges horses face are no different from those of people who live with any level of brain-damage. Xas is the horse in the sunset photo on our home-page. This is fitting because her life symbolizes the fact that what we care about most is the journey we make with each horse, whatever the problems. She was the first foal we bred, a pure thoroughbred. 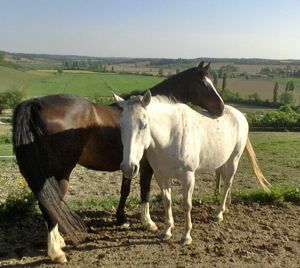 Her dam-sire is Java Tiger (photo right), a big grey racehorse who was known for his ability to sire competition horses, and for stamping his distinctive colour. 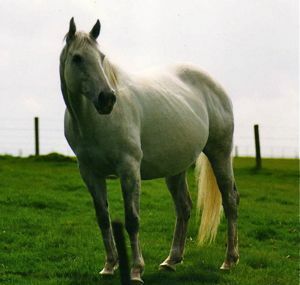 Xas's sire was a racehorse called Captain Maverick who was bred in the United States. Although he was by the famous French stallion Nureyev, he himself was less successful on the racecourse, and ended up covering heavier mares to produce horses for show jumping and only the occasional racehorse. 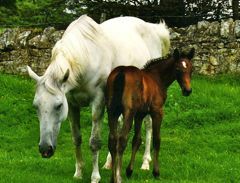 As Dummy Foal syndrome affects mostly thoroughbred foals, it was probably the narrow gene pool of Xas's lineage that is partly responsible for her problems at birth. Xas's mother, Tiggy (photo left), was a living example of the many mistakes people make with horses. She had been race-trained, but never made the racecourse. 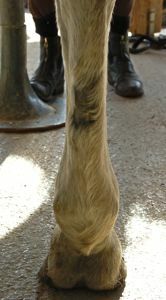 When we bought her as a four year old, her digestive system was already badly damaged due to the cereal rich, low forage diet she had been on, her feet had sand-cracks which had not yet opened right up, but her hooves were soft and flat, and had been already been being shod for years. She was a fairly timid mare but she had developed a hard, stubborn side as a way of protecting herself from demands she couldn't cope with. For many years she had serious problems with red-worm infection. At the time we were following the conventional opinion in most areas of horse-management, so we probably half killed her with synthetic wormers, which never made much difference to the worms. We tried to fix her feet with egg-bar shoes and metal plates. In her training she was perpetually lazy, and any instruction I resorted to would result in forcing her. Any prolonged period of work seemed to result in her injuring herself in some way, probably in order to ensure a sufficient recovery time! She spent more time 'resting' than she ever did working. We had ups and downs, but mostly downs, although we were learning. By the time we eventually lost her to melanomas which were beginning to influence her quality of life too much, she had a lovely last summer here in France, her feet were healed, and she had at last enjoyed some gentle work. In a world where people do the 'right thing' we would never have bred from Tiggy, of course. She had not proved herself in competition, and she had too many health issues. That world misses the point though, and Tiggy's babies have both been priceless teachers, as well as giving Tiggy herself something back to compensate for all the mistakes we made with her along the line. This is an extract from my diary at the time, written in the middle of May in 1999. It describes the first stressful days of Xas's life. "Tiggy had her baby at some time between 2.30 and 4.30am on Thursday morning. When I went out in the morning at about 4.30am, I walked round the field in the mist, and I found her standing at the edge of the reeds, then I saw these dark ears flickering - it was amazing to realize she'd had her baby. When I went up, I saw the foal was the kind of brown colour that turns into grey eventually. I saw that she was a filly a bit later on, so really a miniature Tiggy. She was struggling to get up, but not managing at all really, so I milked off a bit of colostrum and gave it to her from the bottle. then I went to get help. it was hard to know what was right. with Gaby's help we got her standing but Tiggy didn't want to let her out of her sight to suckle, so that was difficult, also Tiggy's bag was very tight and she (Xas) couldn't seem to get the teats. When I look back now, I see all the mistakes, but also I don't think that those mistakes caused the problem. They were just inadequate responses. We should have called the vet then, but I didn't really realize she wasn't a normal foal. We left her for a bit after giving her more colostrum. It was a bit chilly too because of the mist. She did get up herself again, but she couldn't manage to suckle. Then it got worse and worse, Tiggy got very difficult to milk and we were trying to strip her so the foal could suckle, the foal was getting weaker. the vet was on his way when she started to behave in a particularly abnormal fashion - as if she had brain damage. We took them in - with the foal in a wheelbarrow, Tiggy was quite wound up. She (Xas) was very ill when we got her into the stable, curling up and unable to stand - shivering. The vet didn't think she had any chance. This was the point where Gaby had the presence of mind to find out what might be going on with Xas, and after having read about Neonatal Maladjustment Syndrome in our trusty companion 'Veterinary Notes for Horse Owners', she rang Joanna Vardon of the National Foaling Bank in England, who told us not to put her down under any circumstances. Xas was in a coma at this point. The following excerpt from an internet forum gives an idea of current medical understanding of dummy foal syndrome. The term "dummy" foal is one that is given to foals that act "dumb" at birth, or even hours thereafter. You might have heard them referred to as wanderers, barkers, or sleepers. However you know this condition, all these syndromes fall under the broad category of neonatal maladjustment syndrome. While the cause of this condition is not fully understood, what happens is that the tissues of the brain essentially hemorrhage and there is swelling around the nerve cells of the brain due to edema. Hemorrhages may result from low oxygen concentrations (hypoxia) in the blood and episodes of low and/or high blood pressure surges in the blood circulating through the brain. Metabolic insult can include hypoxemia, low glucose, and electrolyte imbalances. Some of these "dummy" foals are normal at birth, then suffer a seizure, followed by a lack of the suckling response. Seizures may be the result of inflammation associated with septicemia that establishes itself in the central nervous system. 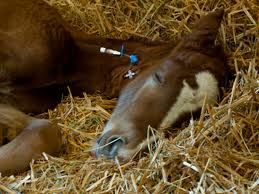 In addition, seizures can be caused by trauma during or after birth, which should be kept in mind when treating the foal. At birth there is an incomplete blood/brain barrier, which essentially means that if there is an infection in the bloodstream, it can make its way to the central nervous system. If these infections cross the barrier into the brain, they can cause inflammation. For example, you would not expect an older foal which develops a lung infection to have a seizure, but a newborn foal which develops the same infection could have a seizure because the blood/brain barrier has not yet formed. This membrane develops and becomes a true barrier in the first couple weeks of life, after which time infections and toxic insults will no longer easily pass from the bloodstream to the brain. Foals with neonatal maladjusted syndrome will behave abnormally for a number of reasons, such as a lack of oxygen due to dystocia, low glucose levels in the blood, septicemia, or other susceptibility due to the failure to receive adequate colostrum. 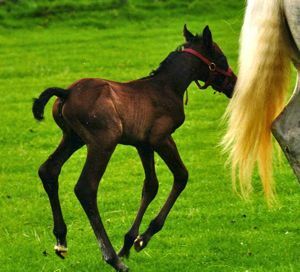 These problems which can lead to a "dummy" foal, or neonatal maladjustment syndrome foal, are accompanied by symptoms that range from mild to severe. "So we began a long and exhausting process, but slowly things have shaped up. I felt then that way I always feel - that I had faith in the process of healing. She [Xas] was tubed with the milk we could get, we got her onto drips and also plasma, she was wrapped up in rugs, we had to hold her through the convulsions. Tiggy was very difficult to milk, she was sedated twice - we got straw in to bed up the box, and lambs teats (rubber) for later if she would suckle. All of that night we had her on the drips until midday Friday. She was starting to fill-in and become soft and full of fluid, but I was treating her a bit [with Cranio-Sacral Therapy] and her cranium was very distressed. Her O-A [Occipito-Atlantal junction] was also jammed pretty solid - in fact I sensed that was the real problem. In the morning she was getting very strong and the vet came with more drips to take her through to twelve - that was the worst time, seriously exhausting. [Thankfully, during this marathon our friends Fiona and Patrick generously offered their help so that we could get some rest!]. It was such a relief when the drip was finished and we could let her go. She was starting to drink more. Her suckling reflex was good through the night. When we let her go and actually walked around with a normal head carriage - with no sign except a slight tip you could only see from the front." "It was incredible. I knew she would live then - although I always really knew. For the rest of the Friday she was drinking more and more each feed, every 15 minutes at first then half an hour and eventually every hour later in the night. She took the bottle lying down mostly, and Tiggy really started to let down and accept the syringe milking. By Saturday night she was getting up easily and investigating Tiggy. we put the rubber teat over Tiggy's teat to introduce her standing the right way but we didn't really try to force her to suckle yet. as it turned out we never did because she got stronger and stronger and by twelve on Sunday she was suckling by herself! It was fantastic because before she just couldn't attach, and then when she could she didn't actually suckle. In the middle of Saturday I treated her quite a lot and so she had slept a lot and seemed very tired, but it cleared so much. On Sunday I didn't feel she could cope with more until the evening - there is quite a fixed kind of pattern, inherent in a way, through the Cervicals - that suggests she lay that way in the womb - developed that way maybe. I don't know, but it clears more every time. She still has a badly bruised left eye where she bashed it on the wall on Thursday. On Sunday, after she was suckling on her own, we put them out in the glebe [the little meadow behind our house], Tiggy trotted round very energetically with baby cantering along like a tumbleweed at her side. since then they have really bonded and we can leave them much more to themselves. They come in at about four. She is suckling very frequently and enjoying it very much. Now it's just her eye and the trace of a tilt..."
Following Wednesday... "she is going out in the field, playing, being quite independent. Growing strong now. Every evening when she comes in, she lies down and stretches out and expects a treatment! The title of this section is deliberate, because although Xas became an apparently normal foal, doing all the foal things such as jumping out of her field twice in the first month and hassling the older gelding she befriended endlessly - she was not a normal foal. Her brain damage has affected her in certain ways throughout her entire life, and working with her has been particularly educational because of that. For example, in a normal growth process, the rates of growth of the different structures are harmonized by our innate life intelligence. In Xas's case some processes were a little out of sync. For her first three years, every autumn she had a mystery lameness. The pedal bone seemed to be out of alignment and her tendons were rock hard. I realized at some point that her bones were simply growing faster than her tendons and ligaments. Eventually when she reached her adult size she stabilized. Having been a dummy foal also gave her certain advantages in comparison with the other horses, for example her spacial awareness is exceptional in most circumstances - she can feel instantly what is under her feet (someone's foot for example!). On the other hand, in her early years she had little instinct for self preservation. Her inability to judge objects or situations external to her landed her in trouble more than once. She somehow caught herself up in the hay feeder when she was a yearling so that each leg was trapped inside. Incredibly she only sustained a slight swelling on the bone of one fetlock joint, although in recent years that has enlarged somewhat. She also tangled herself in electric fencing and got a bad burn on her hock which took over a month to heal. The term Dummy foal certainly suited her then! It is true that sometimes she gives the impression of being perhaps a little retarded, for example she has always needed a 'helper' to look after her when she eats outside, otherwise she is likely to throw her food bowl around or scatter food everywhere. In fact a horse-whisperer who once communicated with her described her as autistic, which would make sense after the dummy foal syndrome. Interestingly she said that the parts of Xas's brain that were damaged related to short term memory and reasoning powers. It is true that she is a very accepting and laid back horse considering her experiences, which perhaps makes sense if she doesn't remember things for very long! On the other hand, as she has matured she seems to have developed a particularly good reasoning ability. One day out riding we were trying to decide whether to go over a little bridge instead through the stream and Xas took one look at it and instantly strode through the stream without a hesitation. She is also aware of 'problems' and she puzzles them out in an unhorse-like way. The example of this that I remember most clearly happened not long after we moved to France, Xas was five or six years old, and her younger sister Ca-va kept breaking out of their field into the woods at the back of the farm. One time she got stuck, and this was the last straw for Xas. She was preoccupied all that day when she was in her stable. That night returning to the field she seemed different, like someone who has a plan. When we reached the top of the road, she turned left instead of carrying on, and took me without any hesitation, straight to the field which has the most secure fencing on the place! It was so funny that I had to follow her advice, and once Ca-va and her were safely installed, there was a definite look of relief on her face - as well as a touch of pride in her problem-solving ability! The other horses have always accepted her 100%, almost in a kind of special way as if they could sense her dummy foal differences, but they never rejected her. As she matured, she became more and more likely to be the supervisor or the maternal one. One morning it was very frosty and the ground was slippery. We had recently 'rescued' an ex-racehorse from the local horse fair, and she was still a bit unused to negotiating such terrain. Xas understood this and put herself in front of Odette, making her walk extremely slowly all the way in, even strictly preventing the little 'race' to get into the stables at the end that had become Odette's particular naughty habit. How would Dummy Foal Syndrome Affect Her Early work? Looking at Xas's life with hindsight, it is possible to see the cycles she has made every year. Like the cycles of a spiral, she always came back round to the same issues but she reached higher and pushed further towards physical strength and suppleness and wholeness in her nervous system each time around. In her third year, at the beginning of lunging work, she started to show some mild signs of head-shaking. Many horses with head-shaking symptoms seem to also have restriction patterns in their cervical (neck) vertebrae, and this was certainly one of Xas's weak points, possibly even a root cause of her dummy foal syndrome, due to influence on her spinal cord. In her case, some basic Cranio-Sacral work was enough to give the nerves enough clearance, and she never showed head-shaking signs again throughout her adult life, except during a period much later on when she was mainly hacking out and she would start to shake her head after some work on the contact. This could have been soreness when her neck muscles became tired, or the result of bruising in her mouth from a blind wolf tooth. Our horse dentist had just started taking them out because he suspected they were sometimes causing a problem. Either her neck strengthened up or her mouth became comfortable because the shaking resolved itself in time. The most obvious influence of the Dummy Foal Syndrome at that time was her extremely short attention span, and the way things could get too much for her very easily. One distraction too many would cause her to explode. She could only really work for a few minutes at first, building up very gradually to a twenty minute session and never more than half an hour up until well into her fourth year. It was always a case of keeping her calm enough to be able to relax enough physically to find her coordination and become supple, all before she lost her focus because she became too stressed physically in her brain! She always wanted to stretch her neck right down and hold her head very low to the ground at a certain point in the session, and still does now. This was obviously connected to oxygen imbalance in her brain, as a result of the Dummy Foal Syndrome, but I was never really sure if it was too much or too little going through. I never pushed her beyond this point, and she tended to need enough time in between sessions to recuperate and develop herself. Definitely more than most horses. Immediately after her recovery from the Dummy Foal Syndrome, her paces seemed normal, but later on tightness had started to creep in as a result of her unbalanced growing phases, as well as a marked lack of coordination in canter, especially the left rein. She would disunite or move in a four beat canter commonly. I found the best solution was pole-work and little jumps, not only did she enjoy that, but it purified her strides and her central nervous system patterning developed in the right direction. 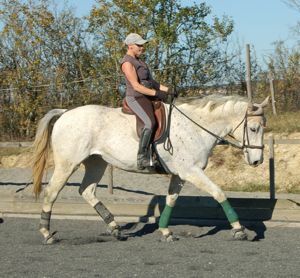 Her trot-work gradually transformed into a cadenced, open movement. She was just at the point of walking around quietly with a rider, giving that lovely safe feeling some horses seem to, when Xas had another crisis. It was literally a few weeks before we were packing up all thirteen horses and moving to France. It was a lameness again, but didn't seem to have any direct relation to the Dummy Foal Syndrome. She was unable to use one of her hind legs and she gradually worsened day by day. By this time I was well on the way to turning away from conventional treatment, although this one was a scary test. I gave her homeopathic and herbal painkillers and took time to distance myself from the doubt and fearfulness which creates a smokescreen in front of what is actually going on. I wasn't experienced enough at the time to feel what I know now was a massive traveling abscess in the entire limb, moving up as far as the sacroiliac joint, but I could feel the power of the process, and I did what I could to support it. After a few days of fever and intense pain, her system won out and she was walking again, and by the time it came to go in the lorry for France she strode up the ramp like she had been traveling all her life. I suspect there was a significant emotional element to her latest crisis, worrying about the move, and what was involved, but she fought it off and rose to the challenge. About a month later in France, the whole sole of the foot of that leg came off, and we could see the enormity of the abscess that had been underneath. I believe when we are healthy enough our bodies clear out toxins in these ways, sometimes in abscesses or cysts. Xas had been injected with plenty of drugs when she had the Dummy Foal Syndrome. Maybe the herbs and therapy she had since that time had helped her to purify her system in this radical way. Xas was making great progress once we arrived and she had settled in France, although she found the general brightness and greenness of everything fascinating and a bit overwhelming. The Dummy Foal Syndrome had definitely affected her perception of colour and different surfaces, but she was rarely scared of anything. I was taking her on short little hacks so she could become acclimatized to the aids very slowly. She was very sensitive to the balance of her rider, but she had inherited her mother's suspicion of anyone trying to take advantage of her. One day I had an argument with her about how she was accepting the contact, I didn't try to fiddle with her mouth in any way, but by trying to make her loosen her neck from my seat and leg, I forced her boundaries because I didn't back off when she got tense about it. I was annoyed with myself for a lot longer than she was, but it helped me to realize that another consequence of the dummy Foal Syndrome was that in every different scenario, she was a completely different horse. I had assumed that the self carriage she had been learning in the arena would be there in her central nervous system on a hack. It was not the case at all, whatever part of her that assimilated and developed this posture was only accessible in the arena. There is always an element of distraction with any horse hacking out, but in her case she was a different horse and she had to go through the whole process again, separately when hacking out. Alternating between arena work and hacking out in an attempt to integrate made no apparent difference. The more her training has progressed however, the better her whole self has harmonized. Working with Xas was a bit like having to use all of the roads in the whole country to get to the other side. There are no real shortcuts with horses anyway, but the Dummy Foal Syndrome seemed to have unraveled her consciousness like knitting, right back to the basics. By being patient and having no expectations from one day to the next, and seeing every step forward as a bonus, it was and still is, a great opportunity to see how things are actually worked out in a horse's mind and body, step by step. Maybe Xas felt she needed a bit of time out at this point in her life, but at the end of the summer - seemingly always a dangerous time for her - she was kicked by another horse. It was a freak accident, a tiny bit of horn from the other mare's hoof was lodged under her skin, causing the whole of the back of her leg to basically open up, so the foreign object could be ejected. What followed was over nine months of hell. 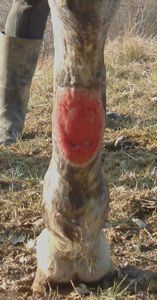 Whether it was because her healing systems were a bit slow because of the Dummy Foal Syndrome, or just the nature of the wound being where the tight skin is at the back of the canon bone, it grew proud flesh like crazy, and in the end - January the following year - she had to be operated on in order to remove it. We used an ointment we found from the United States called Equaide to help with healing the seemingly still vast wound after the surgery, and thankfully it did an amazing job. We were beginning to lose hope that she would ever heal. 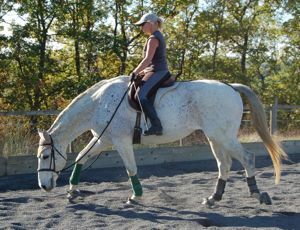 The vet said she would never be rideable again and certainly never come sound because of the scarring on the tendon. This kind of prognosis has never really worried us, after all if we had listened to the Vet in Scotland we would have lost her to the Dummy Foal syndrome at the start. She went out with the other horses as soon as the wound was reasonably safe, and we walked her up our steep hill every day to help the tendon to re-pattern as before, and to avoid adhesions. The photo's above show the successful healing, with only a slight scarring remaining, and no deformation of the tendon. By the summer she was back in work. She did enough careful lunging to build her top-line back up and by the next year she was ready to go into the next phase of her education: becoming a lunge horse. 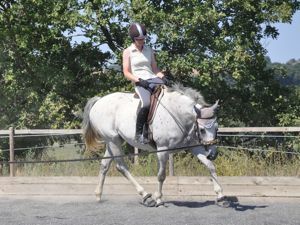 That summer we had several working students, and for all but the most tricky of our horses, working on the lunge with students was good for the horses' minds and bodies. Although it was never possible to bully Xas, she has always been very sensible and honest. She was an excellent teacher because she had to be melted and formed, gently and respectfully, and success meant an opportunity to feel her considerable power. Around that time we were working with a very good Osteopath. 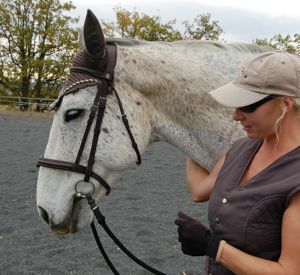 Dorothée Breton was particularly sensitive, and we found that some horses found the osteopathic approach less intimidating than the Cranio-Sacral Therapy, but also that the CST was very important for integrating any spinal or pelvic manipulations. Dorothée looked at Xas one time and said that one of the vertebrae at the top of her neck was actually deformed and much smaller than normal. 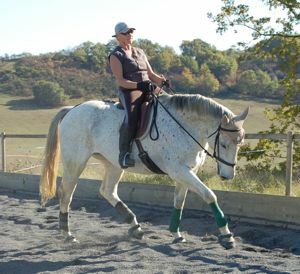 She didn't think it would be safe to manipulate it, but she did think that the work Xas was doing was helping her because the muscle supported her, and correct engagement gradually supples all of the horse's joints, including vertebral ones. Of course I wondered how much of a part the deformity had played in her developing Dummy Foal syndrome at birth. It was another reason to be thankful we had never used any kind of auxiliary aid or physical force to make her 'come round'. Who knows what kind of damage could have been done? She was really beginning to think she could be a dressage horse now, the aids were making sense to her and she was able to truly engage for the first time. She seemed to be able to transcend her body, although she found it hard to raise her neck into a more advanced posture. It had always seemed after those first terrible Dummy Foal days, that anything at all was a bonus, but now she was progressing so well it was exciting to think that maybe it could be possible that all that power she promised might actually fulfill its potential. Ever since I treated Xas in the early days for the Dummy Foal Syndrome, I could feel I had to be careful. I couldn't treat her brain itself for many years, too much change in her system could bring on a kind of brief healing crisis. Sometimes she would have pain in her neck and lie down and want to jam herself up against the stable walls. The Cranio-Sacral Therapy was the only thing which could bring her out of it, but it had to be done with care. These episodes seemed to take place once or twice a year, lasting a few hours, maybe longer. It would have seemed very bizarre if we had not understood her history of course. The summer after her working student time however, she entered a crisis which was much more critical than usual. It seemed to be the heat in the summer which was affecting her at first, she stopped eating much at all, she lay down a lot and she had a slight temperature. We gave her large volumes of colloidal silver in case it was some kind of infection, but I knew it was not a disease as such, it was almost as if her system had reached make or break point. Either her body would change to allow her to achieve what she wanted to, or it wouldn't, there was no middle ground. For what seemed like weeks she was on and off, and she lost a lot of condition and I felt the worry about her like a constant weight on my mind. At this time we had a working student, Naomi Sharp, staying with us who was discovering her ability to communicate with the horses in terms of their thoughts. 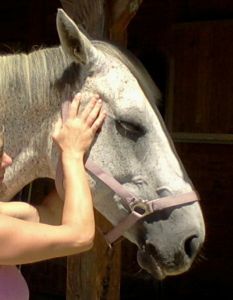 We had been doing some great 'double' treatments, reaching the horses minds and bodies at the same time. When we did this with Xas there were many physical and emotional issues which she wanted to address. One of the fundamental issues to emerge was that she didn't want me to feel responsible for her anymore because she was handicapped or defective. She wanted to be the responsible one. Not only responsible for herself either, she wanted to look after us now, and she no longer wanted to be seen as 'special needs'. 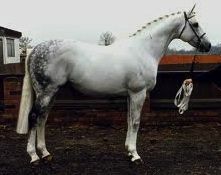 Physical things such as a lack of development in her intestine as a result of the dummy foal syndrome, and patterns from further back which had influenced how her neck had developed were also addressed during the treatment. After the treatment her appetite came back and she gradually began to put weight back on. For the next six months she seemed to be undergoing what felt like a complete spinal reconstruction, even in the spinal cord itself. Other changes began to happen. Whereas she had always been accepted in the herd and got on with other horses, as an adult, Xas had never really been a participator. Maybe the Dummy foal syndrome had made her feel too heavy and slow in her head to want to join in much or have profound relationships with the others. The new Xas simply took her chosen place in the herd, right at the top. She started having a close relationship with Phoenix, the most dominant gelding, and now they are rarely apart. The herd began to follow her when she chose to go somewhere, and trust her decisions. She became a genuine passive leader; instead of dominating the other horses she was confident in herself and her decisions and she inspired the same confidence in the others, especially Phoenix, who has been severely traumatized in the past. In terms of her training, more of the story has been revealing itself and I understand more now about how the Dummy Foal Syndrome affects her. Recently I realized that she controls the oxygen reaching her brain by holding her diaphragm. 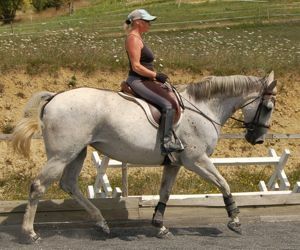 Releasing the horse's diaphragm is one of the main portals to engagement, allowing the rider's leg to merge with the horse and bringing both postural systems into alignment, but for Xas it is also exposing her brain to change. This is why it is so important that I respect her boundaries, because only she knows how much she can let go. The more she lets go the straighter and more energetically she can move, and ultimately the healthier she becomes, but her brain has to be able to accommodate the level of change. This is why it is a profound test of our trust in each other. When I ride her now, I think of it like a journey to find water. At first I am crawling through a tunnel which is dry and narrow, and progress is slow. Gradually I am easing my way through, and there seems to be a bit more room, and the walls are smoother. Soon I am finding a little stream of water here and there. I can hear a waterfall in the distance, incredibly powerful, but I can't reach it straight away. I have to be patient and believe that I will find it. Some days I do find it and it is magical.